Beauty, Hair & Skin Care Remedies & Natural Treatments. Everybody wants to feel good about the way that they look, but it seems there is no shortage of ailments out there determined to tear down your self-esteem. Whether fighting acne, dandruff, or anything in between, society is engaged in an all-out beauty battle. While there is an endless array of products out there that target our insecurities, a lot of them don’t deliver the desired results. Rather than frantically searching for a miracle cure, make sure you’re not fretting too much over the little things (nobody else can see the red speck on the upper left corner of your nostril, truly) and be smart about the way you treat yourself. 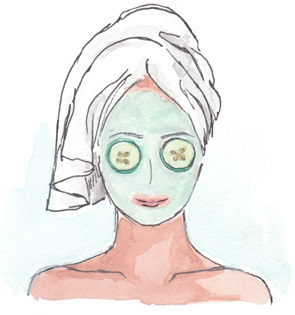 Resorting to unhealthy measures or chemical-laden creams isn’t always the best route to go. When all is said and done, being healthy is what gives you the ultimate glow. 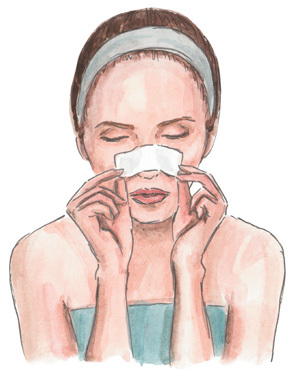 Most people at some point will experience a bout of blackheads. They’re primarily a cosmetic concern, but still, no fun to have those irritating black specks across your face. Surrounded by myths (such as they are caused by dirt, or you can prevent them by shrinking your pores) these pesky little breakouts can seem impossible to get rid of-but they aren’t, especially when you’re armed with an arsenal of solid home remedies. 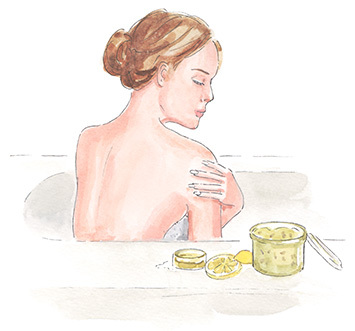 Body scrub is one of the most over-priced, fancifully marketed beauty products out there. Those pretty little containers with their lovely labels wrapped around them are hard to resist, but here’s a secret…they’re actually one of the easiest things you can whip up at home. There are tons of different variations to play around with, but this salt and lemon scrub is a lovely and simple one to start with. 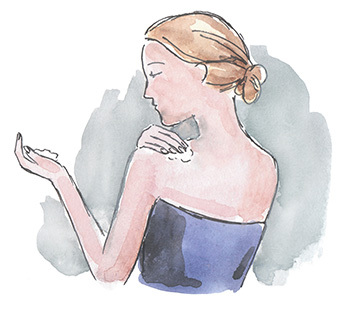 Eczema is an irritating, uncomfortable, even painful condition to live with. A number of things can lead to it, but the result is the same-irritated, inflamed, oftentimes red patches of skin that can affect not just physical comfort but also self-esteem. These remedies focus on helping the skin renew its defenses to break the cycle in which eczema breaks down and damages skin. Feeling itchy? Skin dry? Or maybe you’ve suffered a bad sunburn? Or maybe nothing’s wrong at all, and you just want to feel healed and refreshed. 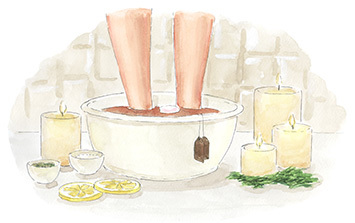 No matter what the need made be, these oatmeal and herb bath bags are perfect to remedy just about whatever ails you, since the ingredients can be altered to fit your needs. They also make great gifts! Nothing is better than going into work and hearing “wow, you look tired.” Because it’s not like you didn’t know how exhausted you were already, and thanks the reminder that you look like you got punched because your eyes are so puffy and dark. 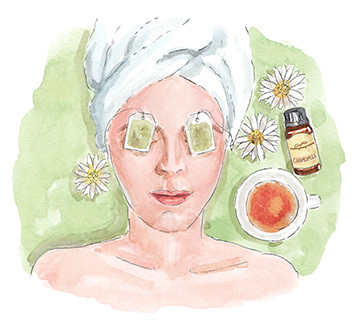 With these easy-peasy remedies, you may not be able to make yourself feel more awake, but at least you’ll look like you were up more than five minutes before that important meeting! Like so many other beauty products, shaving cream is over-priced and over-stuffed with chemicals that just aren’t necessary. 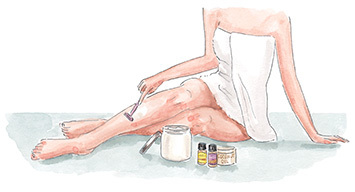 While it may seem difficult, making your shaving cream is actually quite simple-you just need the right blend of healing natural ingredients, a good beater to whip it to the proper consistency, and you can have your own shaving cream that will leave your legs feeling soft and smooth. All you wanted was a tan…but you wound up looking like a tomato. Or you just got the unfair end of the gene pool when it comes to skin tone, and you turn pink within minutes of being outside under the blazing summer sky. 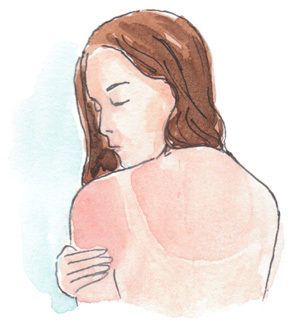 Regardless of how it happens, getting sunburned is a royally unpleasant experience, and soothing relief is necessary A.S.A.P. It looks like an arctic snowstorm just thundered through your hair, but its ninety degrees in the middle of June. What’s wrong with this picture? It’s the dandruff. 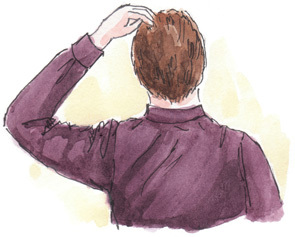 Not to be confused with dry scalp, dandruff is an irritating condition that can ruin even the sunniest of days by sticking in your hair, and making your scalp epically uncomfortable. There is a vicious cycle many of us are familiar with. 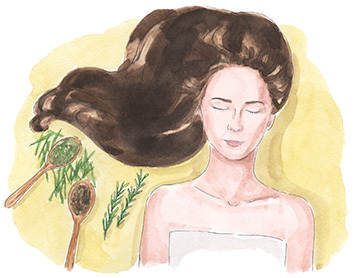 It consists of pacing up and down the hair care aisle and wondering what concoction we should try next, if it will work, and ‘ouch that’s expensive for such a tiny bottle.’ Break the cycle, and try these homemade hair tonics for healthier hair, and all the strength and shine that comes along with them! Honey is an incredible substance with many, many, uses in many, many home remedies. Here we harness its ability to help attract and trap moisture to revive dry, damaged hair-something too many of us have given the ingredient’s in most hair “care” products today. Halitosis, also known colloquially as bad breath, is really not desirable in any situation. Mints are all good and well, but it doesn’t do much to rid the mouth of any excess bacteria, nor does it last all that long. This list will give you some natural alternatives to help get rid of the halitosis, and hopefully keep it at bay longer than simple mints. 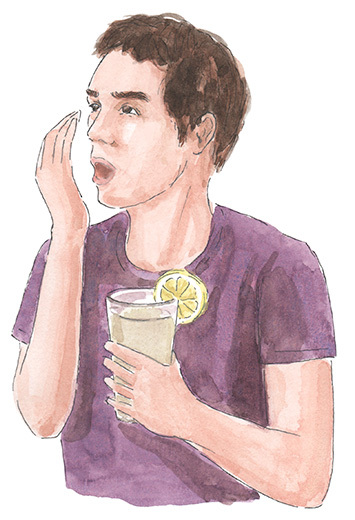 Instead of burning your mouth with almost painfully minty mouthwash, try making your own. The all natural ingredients are simple and easily found in most kitchens, and target the source of the bad breath rather than just masking it. To top it off, it’s also tasty and cost-effective. Caused by the herpes simplex virus, there are no cures for cold sores, but that doesn’t mean that you can’t effectively manage them. 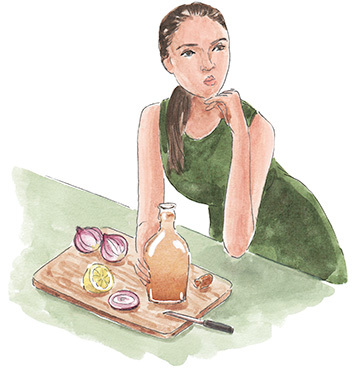 With a little bit of knowledge about these pesky, painful, blisters, and a wee bit of daily dedication, you can naturally diminish the appearance of your sores and make them go away faster. As a Minnesotan, I know chapped lips. So, it was only natural that I was drawn to making my own lip balm-and it is now one my favorite things to make, and to teach other people how to make! 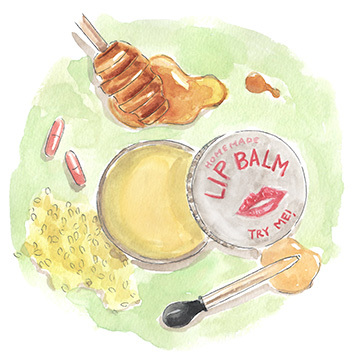 Many lip balms, while apparently effective at first, tend to not actually do much for the lips but sit on top of them, making them feel better until it dries off-leaving you to apply more, which if done excessively, can dry them out. This lip balm is truly healing, with ingredient’s that both moisturize and lock in moisture to help bring life back into painful, chapped lips. It’s also a very basic recipe, and a great jumping off point to experiment with making different types of balms! I know I repeat myself with this, but exfoliating scrubs are one of the easiest and most satisfying things to make at home. While they may appear difficult, those little over-priced jars in the stores are misleading. 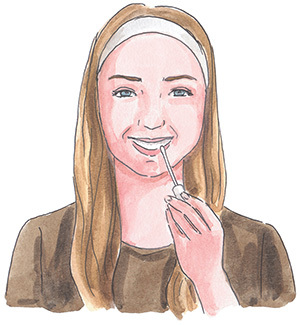 When you find yourself with chapped, peeling, or flaky lips, make your own. 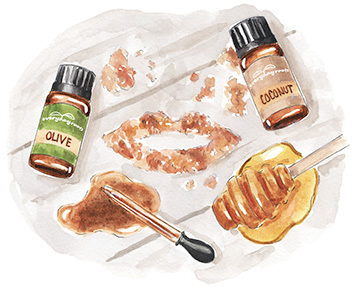 With this recipe you can make a pure sugar exfoliating scrub that’s amazingly effective and costs a fraction of what you would pay for the same thing (or something even lower quality) in stores. Who doesn’t want a white smile? While we tend to take cosmetics to the extreme, it’s possible to lighten up your teeth without the use of harsh (and ridiculously, ridiculously, expensive) over the counter treatments. Not only do these hurt your wallet, but they can make your teeth and gums ache too! Before driving to nearest pharmacy for those whitening strips, have a bit of patience and try these remedies to whiten your teeth at home. Even if you’re the polar opposite of athletic, you can still get athletes foot. 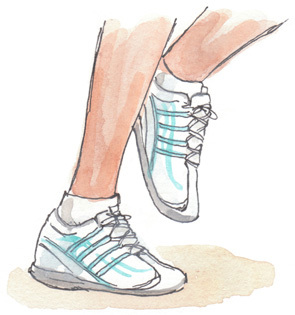 Characterized by dry, itchy, painful, red, and cracked skin on the feet, athlete’s foot targets a part of the body that gets a bad enough rep as it is. It can also be easily transmitted to others-you can even give it back to yourself. As you go about daily life you’re bound to run into calluses, at the very least, and oftentimes corns as well. While the two are not the same, per say, the remedies in this list can be applied to both. When you want to “soften up” a bit, try these (somewhat surprising) recipes. Made with easy to find ingredients, they beat the abrasive OTC treatments that you’ll find at the store. Cracked heels are uncomfortable, sometimes even painful, and many people do not welcome their appearance either. When you find yourself struggling to help them smooth over and heal, try this remedy. 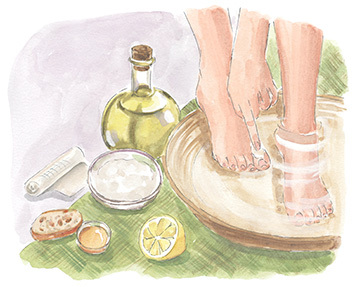 Made with natural raw honey, milk, and orange juice, this homemade cream is designed to heal your heels, no matter how cracked or dry they may be. As fun as it is to get home at the end of a long day, kick your shoes off, and blast everyone in the nearby vicinity with the smell of stinky feet, it’s… really not. Typically caused by bacteria that thrives in the moist environment of a sweaty shoe, these soaks will help target the bacteria and cleanse your feet, leaving them smelling fresh and feeling great. Feet…fungus…when we have toenail fungus, it isn’t something we want to go share with the world. There’s no shame in the fungus game though-it’s quite common and many people have it. It can be frustrating and reoccurring, or maybe this is your first and only bout with it. Either way, these remedies plus some patience and dedication will have the fungus fleeing in no time. love this! Keep it coming!! Looking for something to relieve my dry itchy skin (legs). you should try coconut oil or gold bond itch powder lotion. Do you have anything for chronically dry feet? A soak perhaps, or a healing cream? I love the powder foundation! It feels light on my face like I am wearing no makeup. It also does mot make my face oily and shiny. Thanks for the recipe. 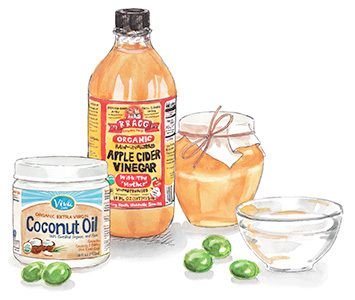 Coconut oil is good for so many things, from oil pulling to weight loss. I never knew I was getting something with so many benefits for the body. I love it.